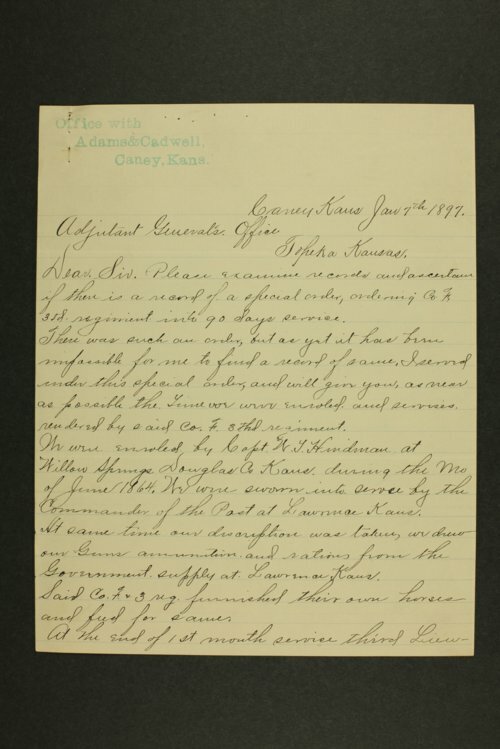 Correspondence sent to the Adjutant General's Office in Topeka, Kansas. Colonel Hiram Allen was the Adjutant General for two years beginning in 1897. Several letters are inquiries made regarding pension money for military service and certificates of service. Other topics include the reorganization of regiments, requests for clothing for use at the State Normal Battalion in Emporia, and the Independent Colored Company of Leavenworth, also known as the Garfield Rifles. One letter addresses a reported "malicious falsehood" written in the Topeka State Journal regarding a disturbance at the depot in Hutchinson upon the return home of Company E of the Second Regiment.